I’m a huge fan of Mario’s various RPG outings. It doesn’t matter if we’re talking about the original Mario RPG, the Paper Mario Series (Which I actually streamed 2 summers ago), or the handheld Mario & Luigi series. I love them all. I have been trying to cram in as much of the newest M&L title in between Keen’s and my foray into Final Fantasy XIV. It’s the first in the series to come to the 3DS and the bar was already set pretty dang high by the last game, Bowser’s Inside Story. However, it doesn’t take very long to see that the game measures up fairly well. Just like in past games you control both Bros. at once. 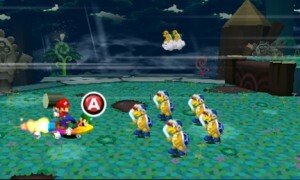 Mario leads the team and Luigi takes up the rear. The A button is assigned to Mario and will perform all of his actions like jumping, hammering, etc., while B is used for Luigi in the same way. In order to traverse some of the game’s minor platforming elements you will need to time your jumps so that both Bros. stick together without getting separated. Bros. maneuvers are also back to help you get around and accomplish specific goals, but seem slightly changed as they are in every version. For some reason you will have to relearn your old moves along the way but you’ll still be doing stuff like using Luigi to hammer Mario into the ground. Interestingly enough, though, in this game in order to pound Mario into the ground you must be on soft ground, otherwise you will only shrink him. In BIS, for example, hitting Mario with the hammer anywhere would shrink him and in order to get underground they would stack up and spin-drill downward. In previous games before THAT each Bro would actually swap positions to hammer each other for those moves. It’s interesting how they make slight alterations to these. I got a little sidetracked there but the general gist is that it’s comfortably familiar. Combat is largely unchanged since Bowerser’s Inside Story. You initiate by bumping into an enemy, or jumping/hammering them for a preemptive strike, and from there you take turns attacking and so on. You can also time your attacks with additional button presses to achieve various ratings that up your damage along with using a well timed jump or hammer swing to dodge and counter-attack enemies. It’s one of my favorite combat systems and it seems to take the best from both SMRPG and Paper Mario games. Badges have also returned in the same form they were in BIS. Each Bro can equip one badge and their combo provides a bonus effect you can activate once the meter gets filled in combat. You can also collect puzzle pieces to get special Bros. attacks but for the most part they seem to be repeats from the previous game. The most interesting change to combat in Dream Team is the use of depth. In some battles you will have to defend yourself not only from attacks on the right and left but above and below you. Sometimes Mario will get chases by an enemy into the distance while Luigi is getting attacked in the foreground. Some of the Bros. attacks also use a lot of depth elements. It’s a pretty cool mechanic that works well with the 3D effect. The game’s premise is a little goofy but seems to be pretty much on par with most other Mario games lately. The main hook in this entry is the ability to enter into the dream world. You can accomplish this by having Luigi fall asleep on various mystical pillows (Which aren’t actually pillows) that you find throughout the game. A special portal appears and Mario leaps in. While in the dream world you are accompanied by a special version of Luigi whom I believe is refereed to as Dreamy Luigi. 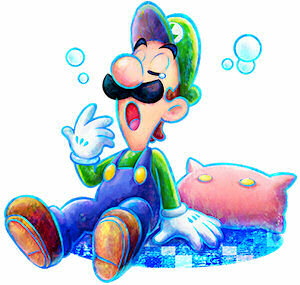 Interestingly enough Luigi is much more powerful in his dreams and is able to affect the dream world environment by possessing various objects or performing special actions that can help you get around. While in the dream world you can see the snoozing Luigi on the bottom screen. Once Dreamy Luigi has jumped into an object you must use the stylus to poke and prod at his sleeping counter part to manipulate the dream world. Tickle his nose when he’s in the sky and he will sneeze, blowing background objects forward. Twist his nose when he’s in a screw to rotate it, pull his mustache to pend tree fronds, etc. Luigi gets put through a lot of abuse. While battling in the Dream World you only control Mario. Dreamy Luigi will assist you by powering up Mario, raising his stats, and by assisting in his attacks. If your timing is right and you get an excellent rating several Luigis’ will rain down on your enemy causing damage and so on. This is needed because in the Dream World you will encounter MANY enemies in combat at once. You also get access to special dream-inspired Bros. attacks that usually involve multiple Luigis. The game is nice to look at but nothing mind-blowing. To be honest I think I’m more fond of the visuals in the previous games but this gets the job done. It uses an interesting combination of 3D objects and sprites. I’m not exactly sure if the character models are three-dimensional or if they are just sprites drawn from every angle. It’s kind of hard to tell and it creates somewhat of an odd effect. I really liked the sprite work in this series, though, so I’m glad it’s not all gone. The 3D visuals effects themselves are alright. Fortunately I haven’t really noticed any ghosting. There are a few instances where the effect is pretty cool but other than that it’s just average. I’m not entirely sure if the game is quite as good as Bowser’s Inside Story or not. Dream Team is REALLY good, don’t get me wrong, but I have a soft spot for the Koopa King. Getting to control him for most of that game was unbelievably awesome. I wouldn’t mind if they made a game solely featuring Bowser. Maybe my Bowser obsession makes me a little biased, I don’t know. Dream Team does make an excellent addition to the series and is at the very LEAST leagues better than the second game, Partners in Time. The M&L series is still on track and that makes me VERY happy. Now we just need to knock Paper Mario back on course. I love the good old Mario and Luigi games, but haven’t played any of the newer releases. Maybe this game will change that.